The NRC National Science Education Standards provide a framework to design curriculum for K-12 astronomy education. At grades K-4, students should be learning about the objects and motions in the sky from a geocentric perspective. At grades 5-8, students should be learning about the motions of the solar system from a heliocentric perspective. At grades 9-12, students should be learning about stellar evolution and the structure of the Universe. In support of instruction, an extensive review of the literature demonstrates that existing research on student learning addresses only a small subset of the astronomy objectives prescribed by the NSES and does not address age-appropriate conceptual development. A need exists to develop and rigorously assess a collection of age-appropriate assessment instruments based on research into student understanding of fundamental astronomical concepts. These instruments would serve to clearly define the expected cognitive levels of the specific NSES objectives and provide a means of assessing curricular materials that claim to be aligned with the NSES. Because of the complex nature of these concepts, the scientific community must be active participants in this process. This column marks anniversaries of the nation's first major environmental bill, the filing of the first Endangered Species Act petition, and the common birthday of two former Secretaries of Interior, one acclaimed, the other vilified. When the Linnean system of nomenclature was proposed as a means for achieving consistency in naming plants and animals at the international level, it was adopted with enthusiasm by contemporary naturalists, since they shared a common background in the Classics. The names used initially were often taken directly from the original Latin or Latinized Greek vocabulary. As knowledge of animal and plant species (living and fossil) increased, this resource was soon exhausted; however, the new names formulated by those early naturalists reflected their sensitivity to those languages. With time and the further expansion of knowledge, it became increasingly difficult for naturalists to formulate generic and specific names on a purely descriptive basis. New names were often based upon personal and place names, handled with varying sensitivity. Words from other languages were increasingly incorporated. In the zoological and botanical Codes, the rules controlling nomenclature have been slackened to the point that almost anything is permissible nowadays. Because of the abandonment of the old standards, some present names, though technically valid, are conceptual and aesthetic disasters and approach total unpronounceability, rendering discussion at meetings and even recollection unnecessarily difficult. It is urged that this situation be controlled by elevating "Recommendations" in the present Codes to the status of rules, enabling future international regulating bodies to eliminate such undesirable appellations. By means of an ordinary liquid-filled field compass, a small bar magnet, and some plywood, a simple device for detecting magnetic storms can be constructed. Magnetic storms are associated with the occurrence of the northern (or southern) lights, or the aurora borealis (australis). Magnetic storms, caused by charged particles ejected from active regions on the sun, depress the strength of the Earth's magnetic field, causing compass needles to show a southward deflection. The magnetometer herein described can readily detect these magnetic storms and can be used to give several hours' warning of impending auroral activity. In recent years, several published reports have assured the public that all is well with the global petroleum supply, citing new oil-production technologies and a record-high oil-reserve figure. Oil production has exceeded demand since late 1997, driving oil prices downward. Global oil consumption, however, is continuing to increase while new oil discoveries decrease. Petroleum is a finite resource, and the production rate will peak and then permanently decline when approximately half of the producible resource has been consumed. The United States has already experienced this; petroleum production in the United States has been in decline since 1970 despite new production technologies and energetic exploration. At recent rates of increase in oil production, the peak in global petroleum production will arrive in about 2008. All is not well with the global petroleum supply, and our society must begin to prepare for the changes that a declining petroleum supply will bring. Software packages are commonly used to calculate the concentrations of aqueous species and to model mass transfer in geological systems. Because calculating the concentrations of all species in a simple fluid composition is difficult, many students focus on using the modeling software without understanding the underlying principles. Writing a spreadsheet program to calculate the distribution of aqueous species in a simple fluid compostion requires students to understand the fundamental principles that describe fluid equilibrium. Students also learn computational techniques used in modeling software and improve their spreadsheet programming skills. Using colored index cards as the "building blocks" of two-dimensional "crystals," students assemble crystals under several sets of instructor-designated conditions of time and geometry. After each simulation, the size and the number of crystals of different sizes are tallied. When all simulations are complete, data from the multiple simulations are compared. At the simplest level, results can be interpreted in terms of cooling- or quenching-time/crystal-size relations commonly introduced in introductory geology. At a higher level, the different conditions of the simulations are examined as analogs for transport and reaction processes operating during crystal growth. Once the basic processes have been illustrated (by analogy) and classified, a framework has been established within which instructors can examine individual transport and reaction processes in more detail. Keywords: Education—geoscience; education—undergraduate; geochemistry; mineralogy and crystallography. Simple scientific illustration techniques can be a valuable addition to geoscience classes. Accuracy, patience, and knowledge of the subject are more important than artistic talent. Drawing teaches the skills of observation, concentration, and visualization and helps students understand and remember what they study. Simple tools, such as mechanical pencils, technical markers, and scratch-board, should be used. Before beginning to draw the object should be measured, a scale should be determined, and the dimensions should be laid out on paper. One should try drawing several views of a single subject, especially for crystallography and paleontology exercises. Grinding, preparing, and using paints made from mineral pigments is an exercise in applied mineralogy. Students gain experience with mineral occurrences and learn about relationships among the physical, chemical, and artistic properties of mineral paints. Mineral colors are especially brilliant in an eggyolk-water medium. The dry, powdered pigment and medium should be ground with a mortar and pestle to make egg-tempera paint (for use on smooth clayboard) or egg watercolor (for use in thin glazes on watercolor paper). Some of the common mineral pigments are iron oxides, clay-stones, copper carbonates, chalk, and charred bone. A hands-on approach to learning geologic principles can be achieved with a simple exercise in lithography. The intrinsic nature of the materials used can foster an appreciation of the geochemistry of limestone formation and weathering, the paleoecology of the environment in which the limestone was deposited, the preservation of its fossils, and the aesthetics of geology in a way that introductory students seldom experience. The exercise resilts in the production of a lithographic print, which is an artistic image, a trace fossil of the creative process of mark-making, and an homage to the spiral of deep time. Students discover that the alchemy lithographers use to create light on paper from grease, water, acid, and stone is much the same as those processes nature used to produce the limestone and preserve the fossils that shed light on earth history. Each student contributes to the lithograph and receives one print from the edition, so each has a proprietary interest in learning how the chemistry of lithography and geochemistry of limestone relate. Michael J. McNerney, American Resources Group, Ltd. Cemeteries can be intriguing places to people, in part because of a fascination with death but also because of the quiet solitude and artistic beauty found there. Many grave monuments are really works of art and can be appreciated on that basis alone. Cemeteries can also serve as teaching laboratories for geologists. Monument types, carving styles, ornamentation, and durability are all related, to some extent, to the type of rock used. The older the monument dates the more variability one can see in the character of the stones. Pioneer cemeteries in southern Indiana, some of which date back to the early 1800s, can be very useful to someone teaching some of the basic concepts of geology. Recognizing and Describing "Pet Rocks"
Political, economic, and social changes have forced oil companies to redesign their corporate goals and business strategies in order to survive. They have restructured themselves and refocused on core businesses, and employees not having the skills needed in this new economy have been laid off. The aim of this paper is to identify the new skills that are required today so that geoscience students can prepare more effectively for careers in the oil industry and to help geoscience departments upgrade their curricula. The findings should help employers and departments to better understand each other's needs and improve cooperation between them, thereby benefitting the geoscience community as a whole. The data presented were gathered from 29 oil companies based in Britain, the most international petroleum community outside the United States. The firms surveyed employ more than 382,000 people, including over 6,000 geoscientists. Representatives from each company completed a 150-item questionnaire comprised of a mix of preferential ranking, box-filling exercises, open-ended questions, and observations designed to assess the importance of a wide range of skills and other issues. 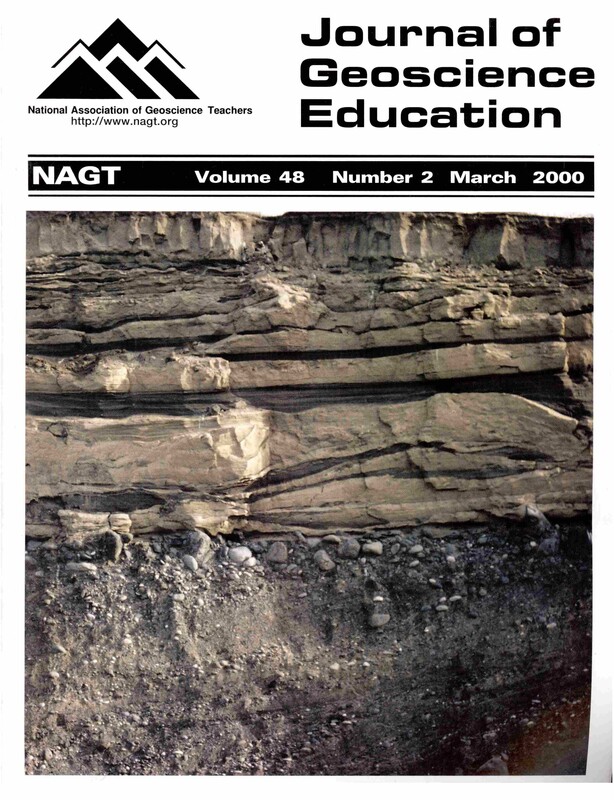 More than 40 geological and geophysical skills were assessed, together with 30 computer competencies, many non-technical and soft skills, business and math skills, and others. Recruiting by the major companies has become very sophisticated and more demanding. Applicants are now expected to have at least a master's degree and some industrial experience. These trends reflect a need for greater competency in both geology and geophysics even though only 54% of the entire skill mix relates to geoscience topics. Recruits should also have knowledge of both geology and geophysics. The level of computer competency now required has also increased, and certain nontechnical and soft skills have become essential. Some courses offered by departments have little relevance in the oil industry. Some respondents believe university computer education may be insufficient. Education in the business areas of finance, project management, planning, and economic analysis needs to be introduced, and departments must emphasize that non-technical and soft skills are important in the work place. They should also expand their teaching efforts in the areas of ethics, summarizing, and teamwork. Companies are very willing to cooperate with departments and to help them in a number of ways. To improve scientific literacy, K-12 educators need to: develop the ablility to use and analyze data, incorporate data into their curriculum, and interact with teachers from other disciplines to create interdisciplinary units. A Process-Oriented Environmental Change Education workshop was conducted for eleven interdisciplinary teams, consisting of 21 teachers, in 1997 and 1998. The National Science Standards provided the criteria for the organization of the workshop. Inquiry and interpretation exercises helped to expand scientific knowledge and skills as well as the teachers' use of technology. We explicitly discussed the uncertainty of science through group discussions and problem-solving activities. More than 85% of the teachers thought the goals and objectives of the workshop were clear, the instructional methods suitable for the stated goals, and the content understandable and logically presented. Our teachers were generally not confident in their ability to interpret data, which is not surprising considering that most teachers have not had the opportunity to do this type of analytical work. Clearly, the scientific community needs to find ways to boost teacher confidence in interpreting data using accepted scientific practice if we expect science education to improve. 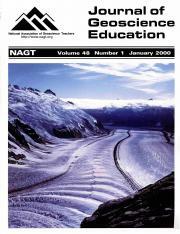 Keywords: Education—geoscience; education—precollege; education—teacher education. 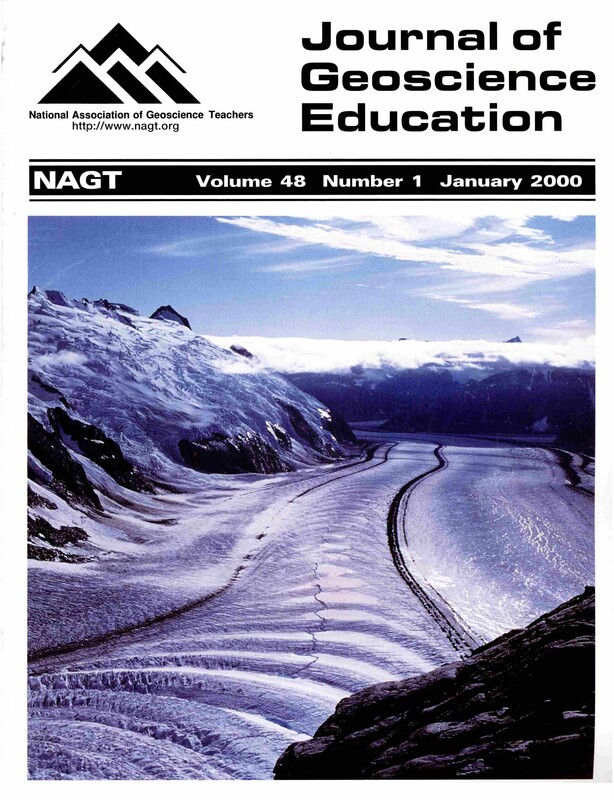 This study investigated the comparative efficiency of computer-assisted instruction (CAI) and traditional teaching methods on tenth-graders' learning of earth science in Taiwan. A total of 151 students enrolled in four earth science classes participated in this pretest/post-test controlgroup experiment. Experimental-group students learned earth science concepts through the CAI, whereas comparison group students were taught by a traditional approach. Results include: (1) Students in the experimental group had significantly higher achievement scores than did students in the comparison group (F = 4.90, p<.05); (2) There were also statistically significant differences in favor of CAI on students' test performance, especially on the knowledge (F = 8.00, p< .005) and comprehension (F = 5.80, p<.05) test items, but not on the application (F = 0.12, p>.05) test items. These findings suggest that incorporating CAI into secondary schools has promise in helping students' grasp of earth science concepts. 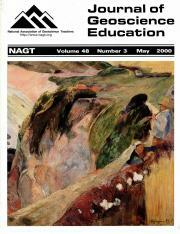 Keywords: Education—computer-assisted; education—geoscience; education—secondary; education—outside United States. The course described here was developed to help improve student skills in reading comprehension, writing, and critical thinking. 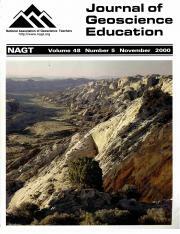 Journal articles on various topics in environmental geology are used instead of a textbook. Topics vary with interest and current importance. Each week, students read an article and write an abstract for that article. A different team of students leads the class discussion of the article each week. The students are encouraged to read the articles critically—to look for inconsistencies and poor reasoning. Abstracts are graded as much for spelling, grammar, and organization as they are for content. The students also pay attention to articles about environmental geology in print media and give a short oral presentation on a topic of their own choice that has been approved by the instructor. The continuous, weekly emphasis on reading for content and then proving comprehension by writing about the article, and further proving it by talking about the article, pays off in increased student ability to read critically and well. The equally continuous emphasis on good writing results in a marked improvement in student writing ability. Keywords: Education—geoscience; education—by reading and writing; education—undergraduate; engineering and environmental geology. The new information technologies provide a great variety of interesting opportunities for instructors wishing to reach new audiences for their courses or to provide instruction to traditional students in new ways. Teaching a course entirely on the Internet requires serious consideration of the characteristics of that medium. Standard instructional design considerations are easily applied to on-line courses, but instructors must recognize that themannerinwhichthingsaredoneintraditional classrooms may have to be modified considerably to provide the same values in an on-line course. It is important that instructors find ways to incorporate feedback, two-way communication, and active learning into on-line "presentations." Different instructors will find different ways to incorporate these components, so it is not possible to say that there is a correct way to teach an on-line course. But serious consideration of the function and appropriateness of every aspect of an on-line course is necessary to provide effective instruction. 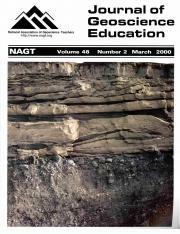 Keywords: Earth science—teaching and curriculum; education—computer assisted.